Parrish Lantern's PomesAllSizes: "A Ribbon Around A Bomb". "A Ribbon Around A Bomb". Frida Kahlo was born in Coyoacán, Mexico, July 6th 1907, one of four daughters born to a Hungarian-Jewish father and a mother of Spanish and Mexican Indian descent. At the age of six she developed polio, which caused her right leg to appear a lot thinner than the other, this remained with her for the rest of her life. When she was eighteen she was seriously injured in an accident with a bus, resulting in fractures to her spine, collarbone and ribs, a shattered pelvis, shoulder and foot injuries, over a year in hospital and more than 30 operations in her lifetime, whilst in convalescence she began to paint. At twenty two she married Diego Rivera, the famous Mexican muralist who was twenty years her senior, whom she described as "I suffered two grave accidents in my life…One in which a streetcar knocked me down and the other was Diego." Theirs was a volatile relationship that had to cope with numerous infidelities, the pressures of careers, divorce, remarriage, Frida's bi-sexual affairs, her poor health and inability to have children. 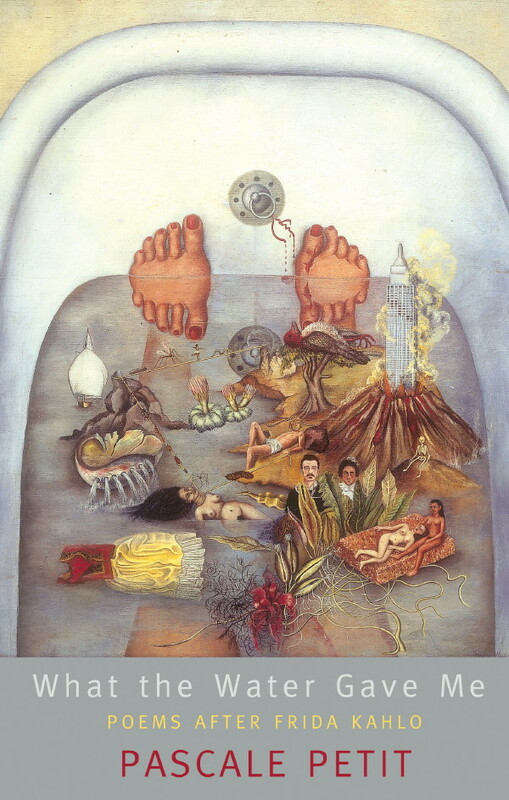 All of this feeds into her paintings, which are remembered for “ it’s pain and passion” the intense colours and how she incorporated Mexican culture and Amerindian cultural traditions into her work, which has sometimes been characterized as Naïve art or folk art, although her work has also been described as "surrealist", and in 1938 André Breton, principal initiator of the surrealist movement, described Kahlo's art as a "ribbon around a bomb". to doodle in the dark. Pascale Petit is a French-born poet who grew up in Wales and lives in London, she trained as a sculptor at the Royal College of Art, spending the first part of her life as an artist, before choosing to concentrate on poetry. She has published five collections of poetry, two of which were shortlisted for the TS Eliot Prize and featured as Books of the Year in the Times Literary Supplement and the Independent. In 2004 the Poetry Book Society selected her as one of the Next Generation Poets. This is her second collection that deals with the life and art of Frida Kahlo, the first “The Wounded Deer” was published in 2005, after which she wrote “ The Huntress (2005) followed by the “Treekeeper’s Tale” (2008) and yet Kahlo still haunted her, more poems kept coming resulting in this new collection “What The Water Gave Me”, which contains fifty-two poems exploring how trauma can become art, how an artist channels the pain and angst, the joy and terror experienced in life through some alchemical process into an image on canvas that has the power to alter those that look upon it, to haunt long after the picture has faded from the eye. These poems pare away layers of flesh to get to the very heart of the artist, to capture that moment of transmutation, although in Kahlo’s instance transubstantiation would work – the change from a figure of pain ridden flesh, to an artist whose life was her palette, her myth. Pascale Petit takes all these moments, these heartbeats and processes them through her own art. Refracting all as though through a prism revealing the whole spectrum of the beauty and terror, pain and redemption inherent in Kahlo’s work, Les Murray (Times Literary Supplement) said “No other British poet I am aware of can match the powerful mythic imagination of Pascale Petit.” and on the strength of this collection I’m inclined to agree with him. This is her third book to be shortlisted for the TS Eliot Prize for poetry, the other two being “The Zoo Father” and “The Huntress” and based on this work it’s only a matter of time till she rightfully takes here place with previous prize winners such as, Derek Walcott, Carol Ann Duffy, Seamus Heaney, Ted Hughes, Alice Oswald etc. This book was sent to me by Seren, an independent publisher, whose ethos is to produce quality writing across a wide-ranging list which includes poetry, fiction, translation, biography, art and history, and are proud of the fact that many of their books and authors are shortlisted for – and have won - major literary prizes across Britain and America. Their reasoning as stated here is “ At the heart of our list is a good story told well or an idea or history presented interestingly or provocatively, what used to be called literary publishing before accountants and managers gained ascendancy. We’re international in authorship and readership though our roots remain here in Wales (seren = star in Welsh) where we prove that writers from a small country with an intricate culture have a worldwide relevance.” They also have a great idea on their site - That if you have a Blog you can request a book for review from their catalogue, which is how I came by this great collection of verse. Interesting. I like the first poem but the word "doodle" is popping out like a sore thumb. Stark contrast to the imagery in the rest of the poem. She had me all the way to the end. I do think that the cover image enhances the poem. Are there more images inside the book? Thanks Mel, I knew nowt about the artist beyond the headlines, but doing a bit of research for this post allowed me a greater appreciation, understanding of this great collection. Hi Tony hope you find it as good as Murakami. Well, you did it again. Introduced me to a poet I never heard of. Very insightful and I really enjoyed the first poem. Wonderful review. I'm not familiar with the artist and don't tend to read much poetry, but you're definitely tempting me. Hi Carol, this is a great book, but if you want a general collection of poetry you can't beat the Bloodaxe books Staying Alive, Being Alive & Being Human. thanks for your comment. How delightful. I'm a Kahlo fan. I like the concept here. I think putting the image next to the poems (in the book) might overwhelm the reader. Perhaps a little separation would be good for the appreciation of the combined works? How is that I've not heard of this poet? Thanks again, Parrish! Off to visit the sites listed. Hi Kinna, hi wasn't aware of her before this book & that was after posting on Derek Walcott's winning of the last TS Eliot prize pipping the writer to the prize, For someone nominated 3 times it can't be long before Pascale wins it for herself. At the moment I'm reading a Greek Poet - Haris Vlavianos, check him out see if you like.